This was the Sea Adventurer's fifth and final trip to St. John's this summer, completing her cruise "Greenland and Wild Labrador". She had visited numerous ports along the coasts of Greenland, Labrador, and Newfoundland. Built in 1975 in the former Yugoslavia, she was designed with a reinforced ice-capable hull, which makes her an ideal vessel for northern adventure cruises. Her current operators, Quark Expeditions, have been using her since 1997, previously under the name Clipper Adventure. Renamed Sea Adventurer in 2012, she visits St. John's around a half a dozen times every summer. In addition, she bares a striking resemblance to another ship that graced the St. John's harbour front for nearly three years, the M/V Lyubov Orlova. The Orlova became a staple of the harbour view after she was seized by the Canadian government because the group that was chartering her owed money to their crew and the ships owners. She sat, derelict and at times listing, in the harbour until she was bought for scrap last year. She was towed out of the harbour by a tug that was WAY too small for her, and her line snapped, leaving her adrift until she eventually sank somewhere near Iceland or Ireland a few weeks later. The Adventurer hasn't had an accident-free career either, mind you. in 2010 she ran aground on a charted rock in Nunavut's Coronation Gulf. She was towed and repaired, and her crew was found negligent in the accident because the rock was marked on a chart and had just been ignored. Since then, she appears has been taken much better care of than her late sister. She was sporting what appeared to be a relatively fresh coat of paint while she was moored at the fuelling station, and her fittings on the inside still leave her as one of the nicer adventure cruise ships to sail on. That being said, I still find myself doing a double take every time she arrives in the harbour, and having to remind myself that it's not the Orlova. Sounds silly, but after seeing her in port for that long, you would probably do the same. It's no secret to anyone that I love when the navy boats are in, and I've already reported on the HMCS Shawinigan and the HMCS Glace Bay when they were in back in July. 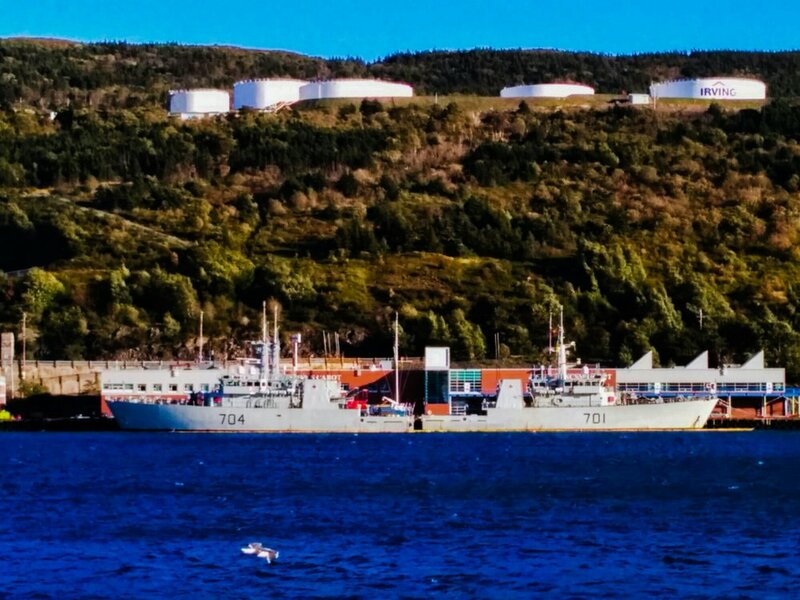 This time, though, there are three ships moored over at HMCS Cabot - the HMCS Kingston has joined the other two for a couple of days in port. As I've mentioned before, these ships are used for coastal defense, monitoring Canadian waters and performing search and rescue and law enforcement operations. They're also the ships that members of the Royal Canadian Naval Reservists serve on, with a select number of regular force Navy personnel assigned depending on the requirements of the assignment. Unfortunately, there isn't a lot of information available about this particular ship from the French Naval fleet. She used to be a fishing trawler, and was purchased by the French Navy in 1997 to be converted into a naval patrol vessel. She is posted to St. Pierre-Miquelon off of the Newfoundland coast, and can usually be seen a few times a year (according to Halifax Shipping News) in Halifax harbour. She also underwent a significant refit at a foundry located in Lunenburg, NS just last year. She was only in for two days, though for what I'm not sure. The Alboran left this evening, and was only in port for a couple of days. Built in 1994 and switched from the Secretariat of the Seas to the Spanish Navy in 1997, she is used primarily for fishery patrol and surveillance missions, as well as providing support for the Spanish fishing fleet. She is also outfitted to have a light helicopter on board. This year, her visit has her participating in the same Northwest Atlantic Fisheries and Oceans (NAFO) mission as the Portuguese Navy Vessel, NRP Viana do Castelo was participating in when she was in port. This is the Alboran's last trip into port. She was scheduled to be at sea for a month an a half, and will be returning to Spain on October 24th. Last year, she participated in the 2013 Bluefin Tuna Conservation Campaign in the Mediterranean Sea. That's all for this week! Have a great weekend everyone. Images used this week are all my own.